Yesterday was the first Annual Jazz & Colors Event held in Central Park. Imagine, thirty different bands playing at thirty different sites in the park but with one playlist for all bands. I wanted to enjoy all the bands but that is just impossible unless I could fly from one site to another. Besides, I had a birthday celebration to attend around 4pm and I know I can be at the Park for only the first half of the performances. Still, listening to and enjoying six bands out of thirty play the setlist is good enough for me. When I arrived at the Park's Artists Gate, the Kimberly Thompson Quartet was setting up their equipment near the Jose Julian Marti statue. It was 10 minutes before 12 noon, the start time of the performances. From the Jazz & Colors website ..
30 Bands. 30 Locations. 1 Setlist. You’ve never experienced autumn in Central Park like this before. 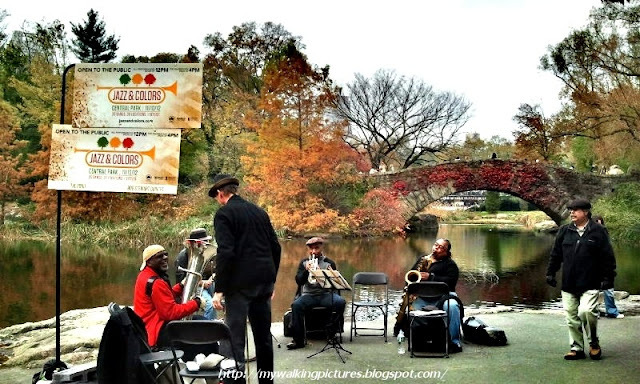 Brilliant with the colors of fall and more alive with great jazz than ever before, for one afternoon Central Park will be teeming with talent, as artists perform in every corner of this great urban oasis. 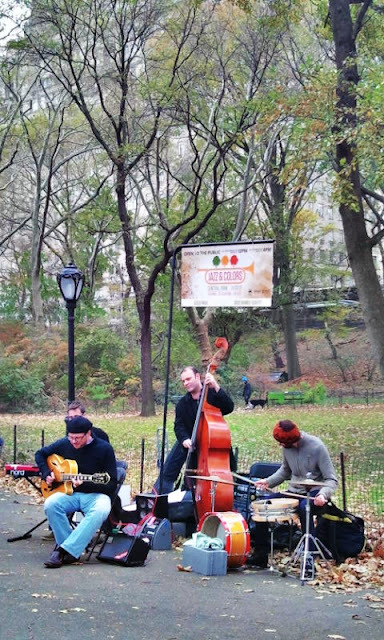 From the shadow of Duke Ellington’s statue to the hum of Columbus Circle – and virtually everywhere in between – the Park will be filled with music. Enter anywhere you like, linger as long as you like. Stop in at an information center if you need directions or mementos. Let the music and this map be your guide. Thirty ensembles will be interpreting a single list of songs as they perform at some of Central Park’s most beloved sites throughout the afternoon. Each will use the setlist to paint the aural landscape in their own style. Find new favorite artists, songs, and places as you explore Central Park in a whole new way — and enjoy. 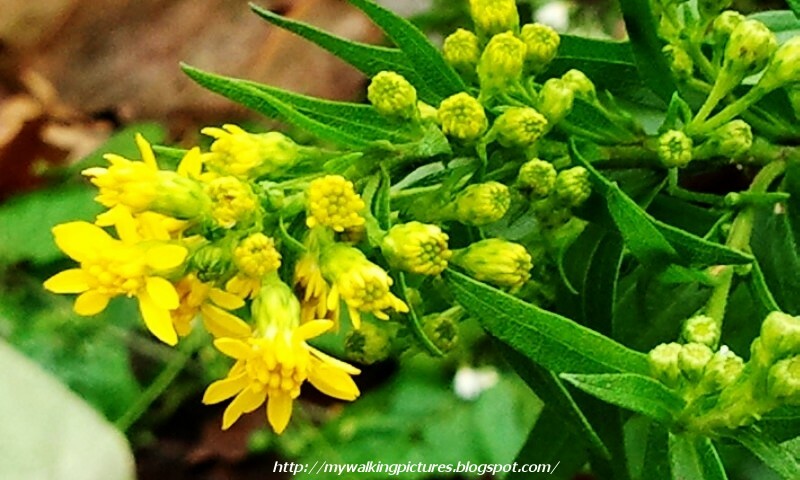 As I went down the stairs towards The Pond, I saw these yellow flowers. I don't know the name but I seldom pass up the opportunity to take a picture of pretty flowers. 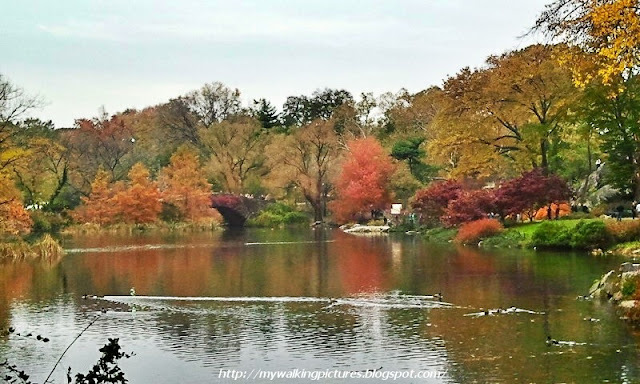 Inspite of the damage caused by hurricane Sandy and the nor'easter Athena, the area around The Pond was as colorful as the autumns of previous years. There were a couple of people painting when I passed by. 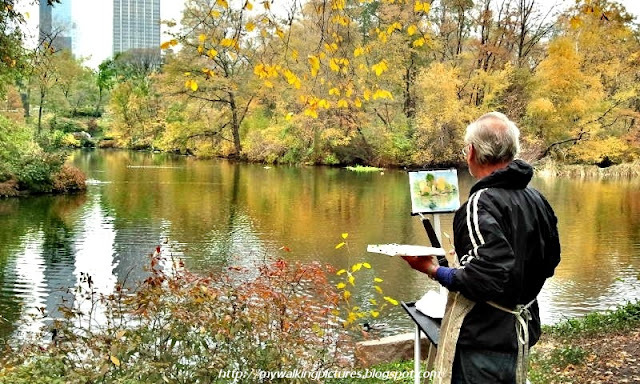 The Pond area is a good place to prop an easel and capture the colors of the landscape. By the time I reached the area near the Gapstow Bridge, the Bob Stewart Quintet was ready to play. The first number on the playlist was Straight No Chaser. The rest of the setlist had titles referring to the autumn season or to New York, the city has always been a magnet for jazz musicians then and now. 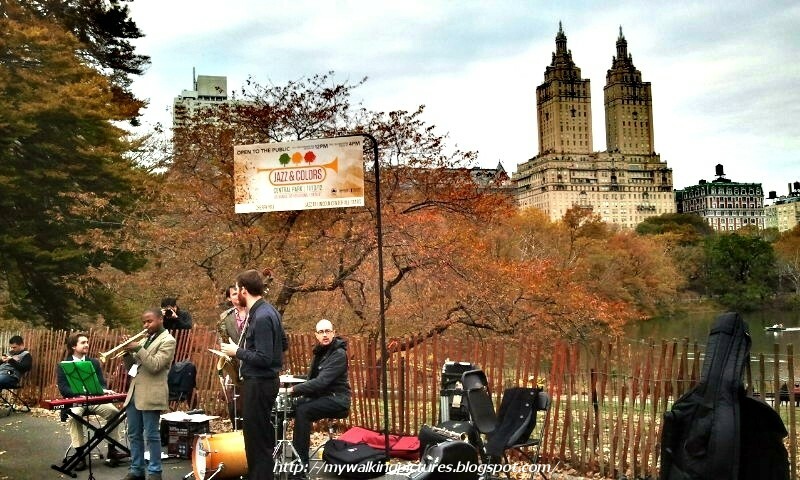 Then I'm off to the next band, the Jacques Schwartz-Bart Quartet who was performing with special guest Stephanie McKay, with the Central Park Dairy House providing a nice backdrop. The Olmsted Bed on The Mall was just a short walk from the Dairy House where the JD Allen Quartet was playing. New York is really a diversified place. If jazz music is not your cup of tea, just around the corner from the quartet at The Mall, this dance group was performing to a different kind of audience. 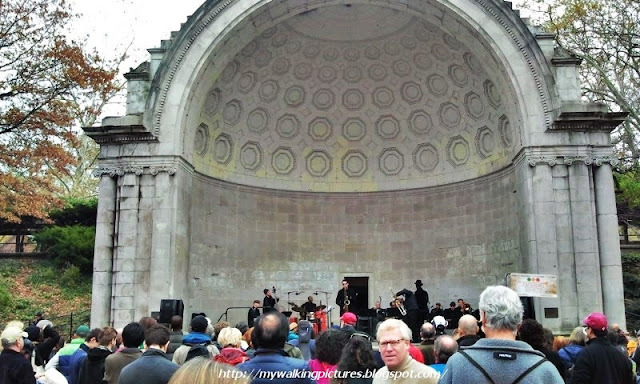 When I reached the Naumburg Bandshell, the Mingus Big Band was well into Autumn Serenade. I stayed there for Goodbye Pork Pie Hat, impressive solos from some of the band members. 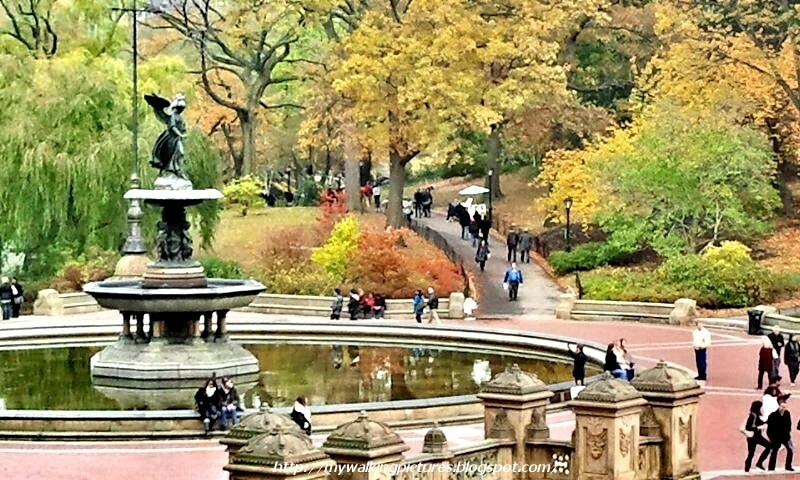 On my way to listen to the next band, I passed by the Bethesda Fountain, the heart of Central Park. 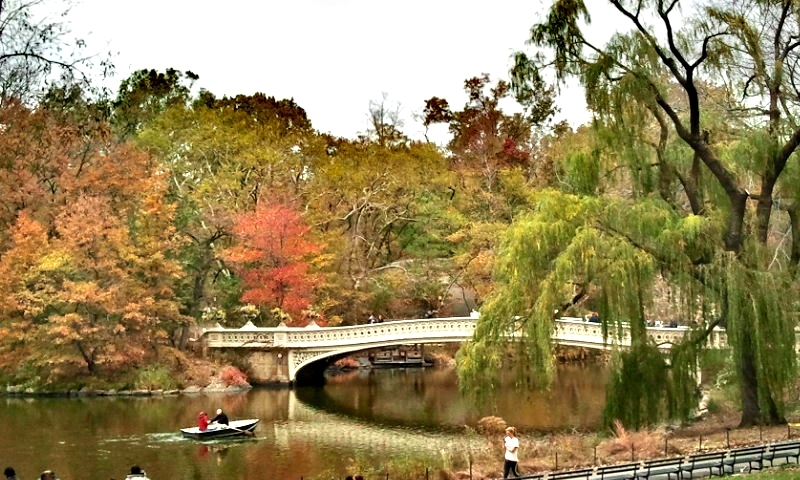 I also passed by the Bow Bridge, it's so pretty seeing it always makes me smile. 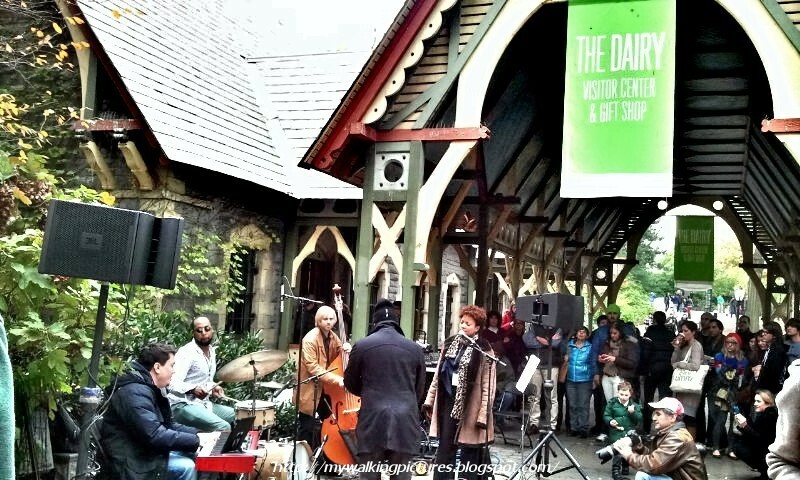 I then turned towards Cherry Hill where The Klezmatics were playing. 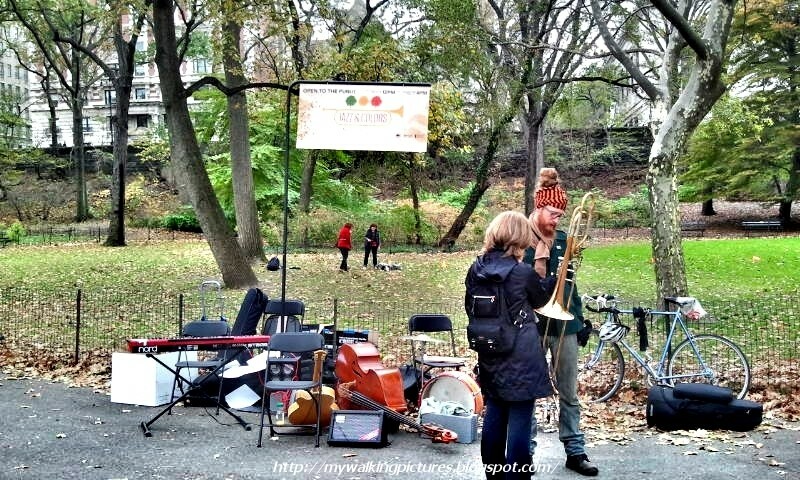 Their trumpet player was very young, and it was a joy to hear him play. By then the band announced that it was break time and they will be back after an hour. 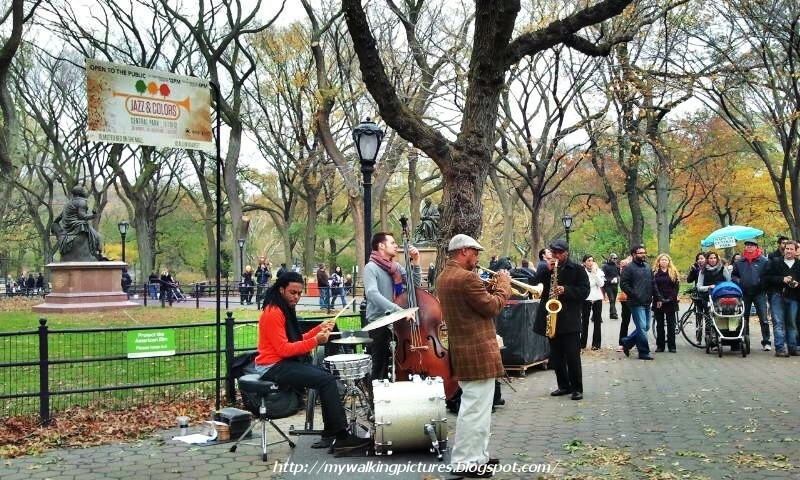 I hurried to Azalea Walk in the hope that the Doug Wamble Quartet was still playing. 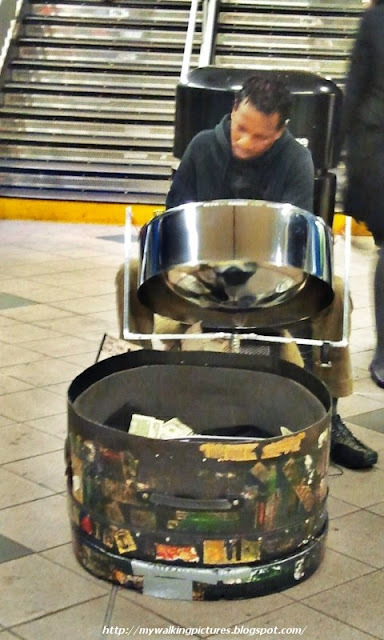 No such luck, the band has taken a break, too. 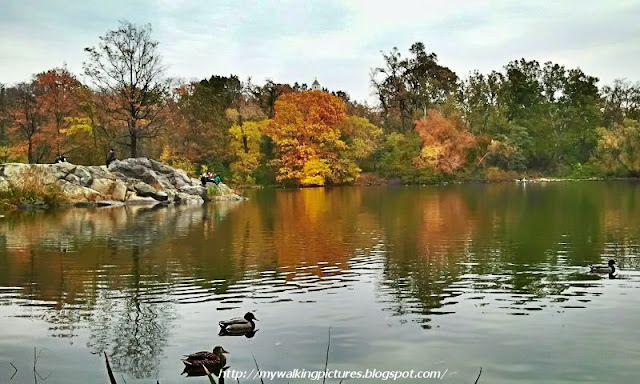 I still have some time before I leave for the birthday party I had to attend so I went to the area by The Lake to take more pictures of the fall foliage. The buildings of midtown Manhattan are reflected on The Lake. Then I proceeded to the Oak Bridge, it has great views of midtown Manhattan, too. From the bridge, you can see One57 Building minus its crane which collapsed during hurricane Sandy. 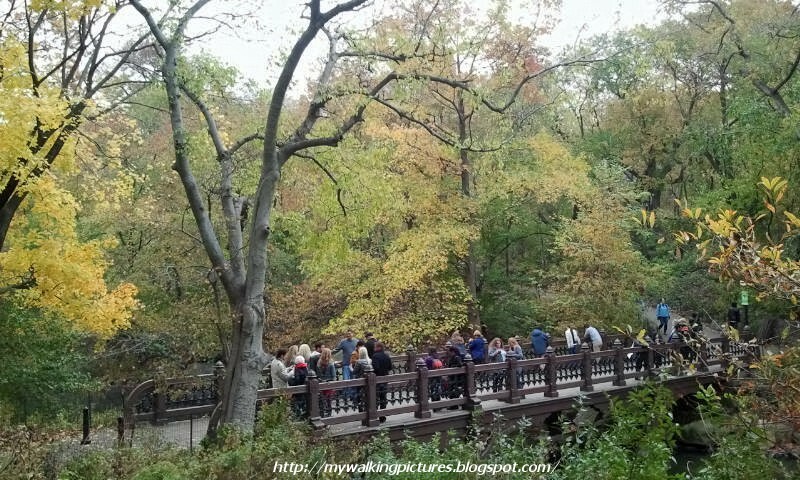 The other side of the Oak Bridge has great views of the fall foliage around Bank Rock Bay. 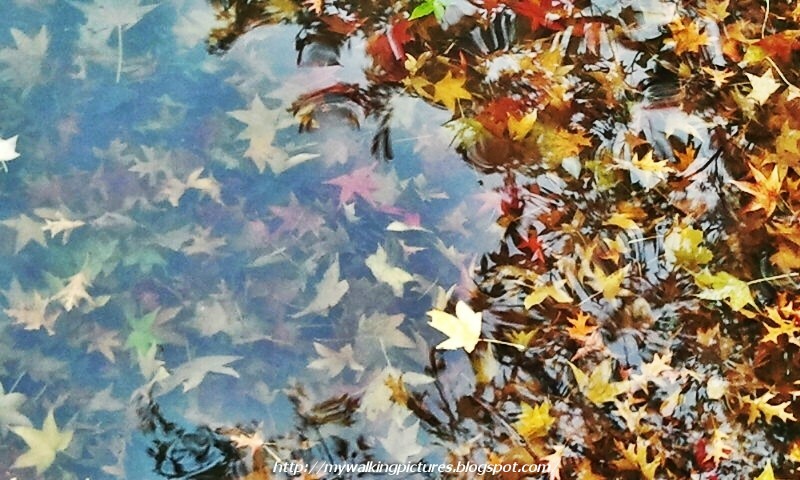 The colorful leaves which fell on the water made an interesting picture. As I was taking pictures of the leaves, I noticed some people beside me had their attention on the rocks near the water. 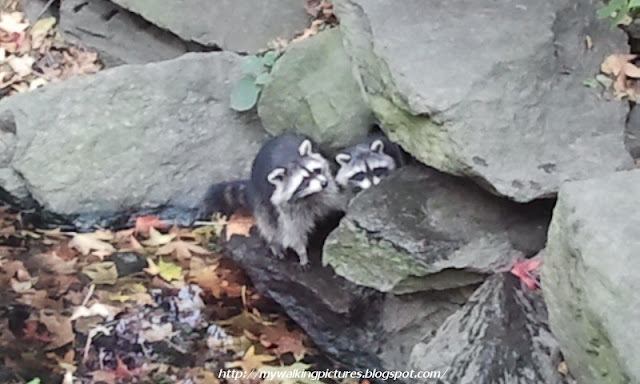 It was then that I saw them .. raccoons! Pretty soon another head poke out, there were three of them! And I saw another one running around the area but too far to take a pic with the others. There are no raccoons in my home country, it was my first time to see them so I was excited and a little bit fascinated. 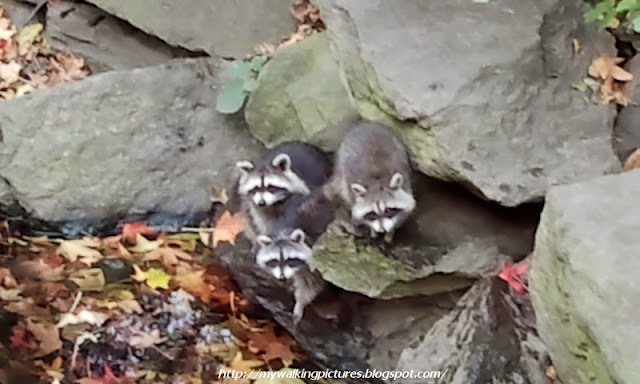 I didn't realize I had spent nearly an hour being entertained by these critters. By the time I left the Park, the Doug Wamble Quartet was already playing the first tune of the second set, Scrapple from the Apple. By that time I really needed to leave, I wished the bands would still be there the following day to play but I guess this was just for the day. If I had the rest of the afternoon free I could have covered a lot more bands, but then, family always comes first. 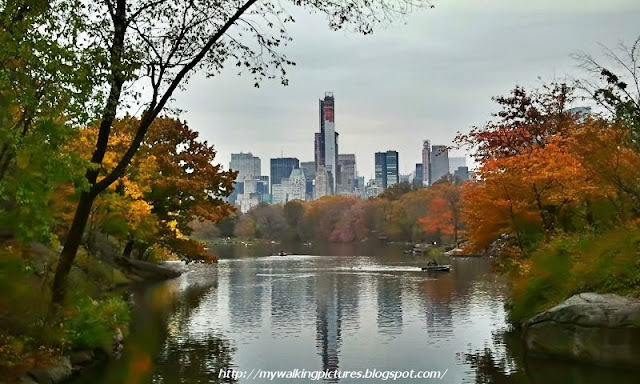 So I left the park to go to the nearest subway station. 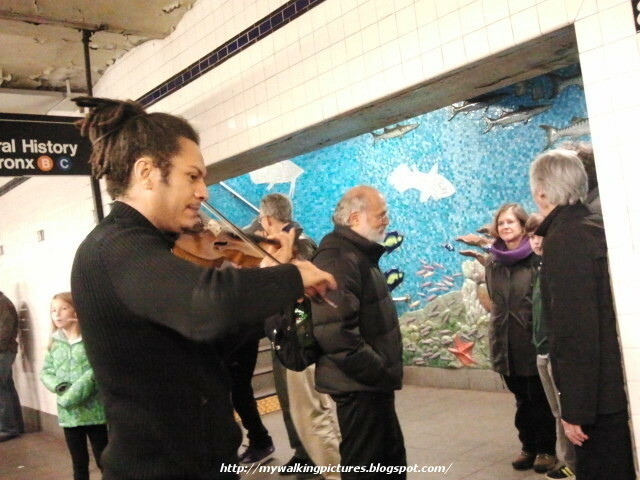 New York is always a haven for aspiring musicians and this violinist was there, playing at the 81st St. subway station when I came down. I got off at the 59th St.-Columbus Circle station and there, another aspiring musician was playing a steelpan. one of the most prestigious venues in the world for both classical music and popular music. 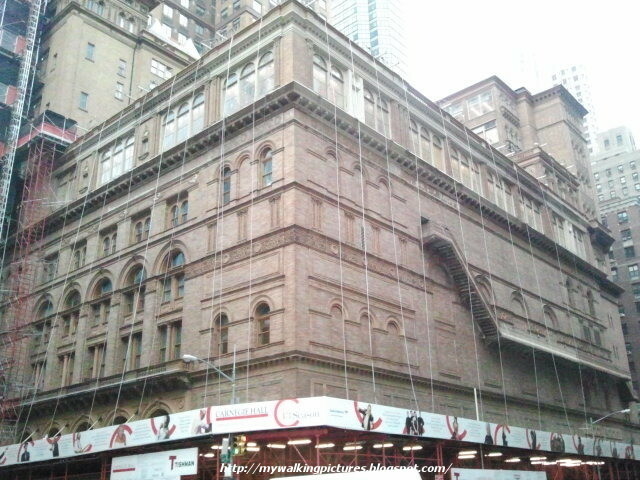 Have the bands and aspiring musicians I heard today ever performed in Carnegie Hall? I have no idea, but if they haven't yet I think they've dream of performing there one day. I heard so much music that day and loved every moment. 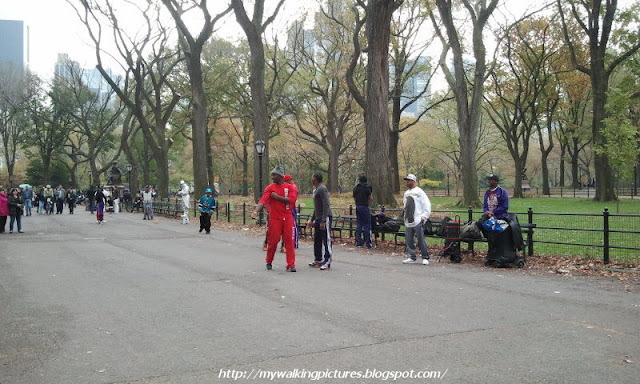 Thank you to Jazz & Colors and to Central Park for an amazing collaboration. I look forward to next year's performances. I hope I get to listen to more artists and enjoy their music. I may sing out of tune most of the time but I do enjoy good music when I hear it. It warms the heart and sometimes heals and gives hope to the weary spirit. 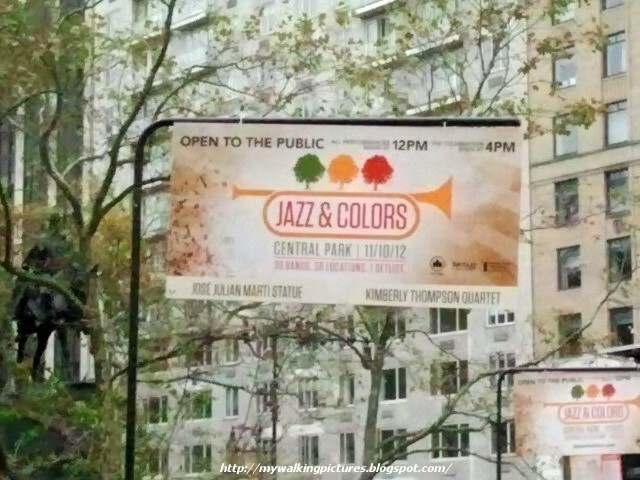 For the rest of my Jazz & Colors at Central Park pics, here's the album on Flickr. 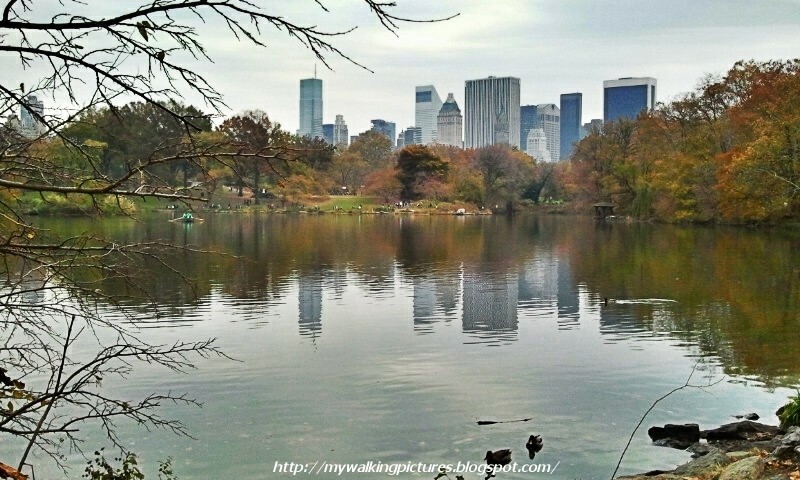 Wow Gigi..all the pictures are so stunning..really capture the essence of the event and how wonderful New York is. I want to live there! :) You have a real professional eye..I see this going somewhere.. Thank you, Ari! I wanted to stay and listen to more bands but I had another commitment. I'm looking forward to next year's performances. Hopefully by that time I'll have a better camera than my trusty phone cam.